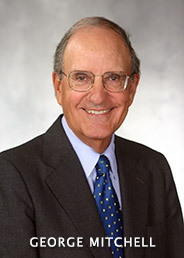 George Mitchell is a distinguished U.S. Senator (Maine, 1980-95), Statesman, Author, Business Leader, Special Envoy for Peace, and author of “The Mitchell Report,” an investigation into Major League Baseball. Senator Mitchell joined Baylor President Ken Starr on Tuesday, April 16, 2013 for On Topic, an engaging conversation about our country and important issues facing our nation.